Thrills Christians about their eternal future, and shows how that future changes their present. Our view of the future affects how we feel and act in the present. 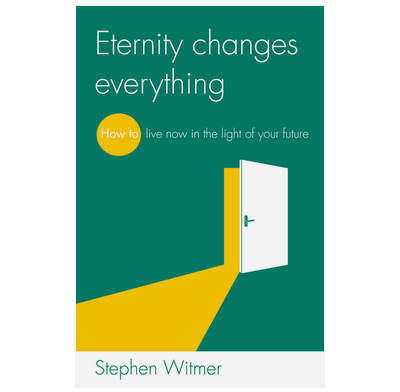 Stephen Witmer excites us about where the world is heading, gives certainty about where we as individuals are heading, and thrills us about how eternity really does change everything in our daily lives. If you are worried about your future… or if your future doesn't seem to make any difference to your now… or if you simply want to get more excited about where you will spend eternity… read this book! I'm so thankful that I picked up this book and read it! Every chapter moved me to tears. It created an excitement in me for new Earth like I've never experienced before. Out humbled me to think on God's great love and how he has promised that he will dwell with us once again. It created repentance in my heart for the times that I have refused to sacrifice my own desires while I'm here in this broken world when God has told me what I have to look forward to. I would definitely encourage any believer to read this book. It will encourage and strengthen your faith. It would seem to me he is more concerned with a "paradise earth" than heaven. Indeed at one point, he says that,"Heaven is not as good as it gets..." and that "Heaven is not our final destination"(chapter 2) At the end of that chapter he says," what an amazing indication of the beauty of the new creation:it's better than heaven. This is the future of our world." Don't think I can agree with this in the light of scripture. If you hadn't asked me for this review, I intended getting in touch anyway... Would appreciate your feedback on this. Hello, thanks for your review. I think you've read Stephen's point correctly — he is pointing us towards a 'paradise earth'. He's resting that on Bible passages such as Revelation 21 v 1-4, where John sees a new heaven and a new earth, and in which God dwells with his people (just as he did in this world, in Eden, before the fall); and 1 Corinthians 15 v 35-57, where Paul teaches that we'll receive our resurrection bodies when Christ returns. So while heaven right now is amazing, it's not where we were created to live eternally - we were designed to have a bodily existence in a physical world. This is also what the prophets promised (eg Isaiah 65 v 17-25). In one sense, you could call that place 'heaven' or 'earth' — but I think Stephen wants in his book to encourage us to see that the Bible teaches that our eternal future is physical, and 'earthy' - and perfect! I really enjoyed reading this book. I found Stephen's style engaging and clear and thus finished "Eternity Changes Everything" in a single sitting! I am certainly guilty of forgetting the imminent reality of our certain eternity and at times not being restless enough for meeting Christ face to face. This book got me excited again about meeting Christ and the wonderful future we have in Him.